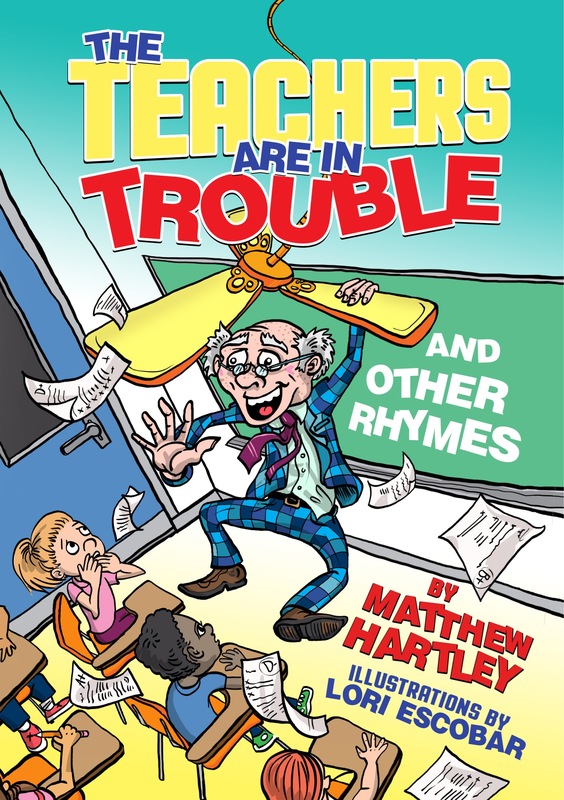 Book Description: Matthew Hartley’s book, The Teachers are in Trouble and Other Rhymes, is sure to make you laugh out loud. In these pages you’ll find the King of Burps, the boy who wouldn’t eat his greens, the teacher who got detention, and many more colorful characters. The illustrations are by Lori Escobar, whose art perfectly suits the humorous rhymes. Well, I’m a humorous children’s poetry book for middle grade readers. If you look under my cover you’ll find forty illustrated poems there, such as The King of Burps, the boy who wouldn’t eat his greens, the teacher who got detention and a whole lot more. Mostly every poem in the book has to do with things that happen at school, which are dealt with in a humorous way. What makes you so funny? I think what’s enjoyable about me is that readers can relate to the poems. Take for instance, The Protest, which is about some kids who are staging a protest against homework. There are lots of kids who wish they had the freedom to do that, and in my poem they do. Well, my author likes to write about things that aren’t normally funny and then tries to make them funny. Take for instance, My Forgetful Teacher. That poem is about a kid who’s really frustrated because his teacher can’t remember his name. His solution to the problem is to wear a giant sign with his name on it. He’s sure it’ll solve his problem, but then he discovers she can’t read. They’re maybe not so similar in style, but June Factor’s book, Roll Over Pavlova has had a big impact on him. He first read the book as a kid and liked how poetry could be funny. I think Lori Escobar who illustrated me is really talented. She did a lot of work on me and I’m happy with the results. I hope everyone agrees. As for my favourite image, it’s too hard to pick a favourite. The effect I’ve had on my readers has been very positive, which is great. I’d have to say, the best thing that’s ever happened to me was a teacher read some of me to a class and they loved it. Well, the worst place I’ve ever visited was the trash. My author was too critical of me one day and threw me out. He fetched me out a couple of hours later, but I smelled like tuna! He’s also left me on a train a few times and I had no idea where I’d end up! That was a pretty scary experience! The best place I’ve been to is the Little Free Library in California. My author was pretty jealous I got to go there and he didn’t. Well, I certainly wouldn’t want to be in the hands of Dr. Suess, Enid Blyton or Roald Dahl. Those authors are dead, so they wouldn’t be able to appreciate me. I’m happy though to be in the hands of any person who can read, or is learning to. Well, I hang out a bit at Amazon, Barnes and Noble and places like that, but the top sellers continue to shun me. I guess I’m not cool enough to hang out with them yet. It’s really hard to pick up reviews there as well. So far a lot of reviews have shunned my advances. I’ve had a bit more luck at independent stores around Australia. I especially like visiting those places with my author. He’s a pretty good wingman! Matthew Hartley was born in Melbourne, Australia and began writing stories at an early age. He wrote his first book in primary school, which was called Psycho Robots. He printed some copies and the book was a huge hit with his classmates, but it did not receive wider recognition. In 2017 he published the humorous poetry collection, A Fright in the Night and Other Rhymes. 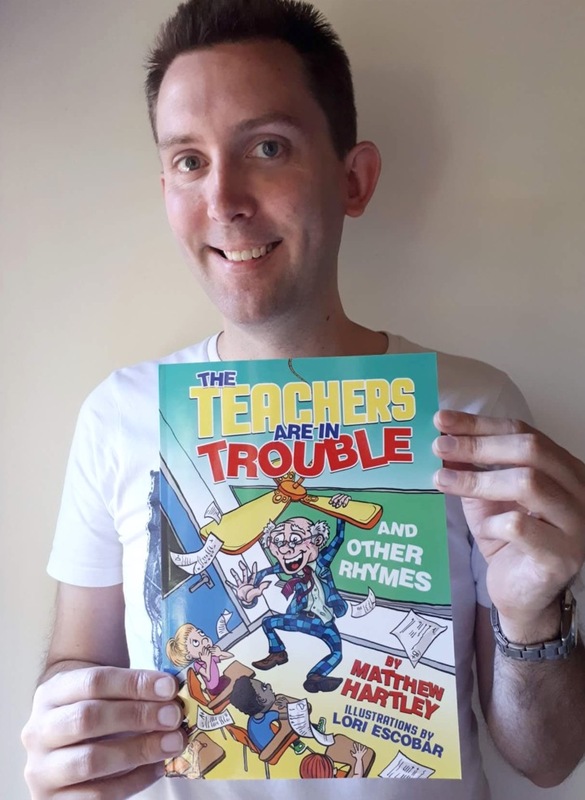 A second poetry book, The Teachers are in Trouble and Other Rhymes was published in 2018. He is currently working on his first middle grade book series.